The UC system is an innovation powerhouse, not only in California but throughout the world. UC generates an average of five inventions per day and holds more patents than any other university in the country. 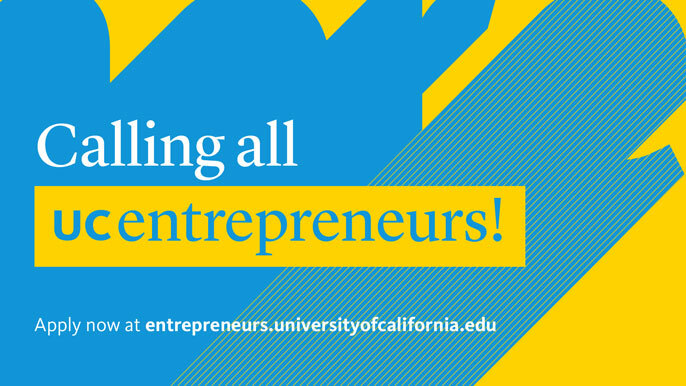 In 2013, UC President Napolitano launched the Innovation and Entrepreneurship Initiative to leverage the scale and diversity of the UC system to build an even more vibrant entrepreneurial culture. Calling all UC enterpreneurs — it's time for the third annual UC Entrepreneur Pitch Competition, a systemwide effort to connect new and veteran UC entrepreneurs with coaching, resources and exposure to a network of investors to advance and scale their startups. The university’s Office of Innovation and Entrepreneurship is inviting startups with at least one UC student, faculty or alumnus founder to pitch their startups to investors and strategic partners by submitting a pitch video and an associated pitch deck to the competition website. Video submissions will be featured on that university website, showcasing the impressive entrepreneurial activity and rich innovative spirit of the UC community. There are two tracks in the competition: an early-stage track for startups in funding round pre-Series A, and a later-stage track for startups in Series A and beyond. A panel of distinguished corporate mentors will review and select a dozen finalists: six startups in the early-stage track and six startups in the later-stage track. All finalists will receive individualized coaching from their mentors before their final presentations at the fourth Annual Global Corporate Venturing & Innovation Summit in Monterey on January 30-31, 2019. Finalists will then pitch their startups to more than 700 business leaders and venture capitalists. The winner in each of the two categories will take home a $15,000 prize for his or her company. Dr. Sophia Yen, winner of the 2017 “I am a UC Entrepreneur” competition, explains why you should enter this year. Judges and mentors for the 2018 UC Entrepreneur Pitch Competition include Linda Elkins, chief technical officer, Gore Innovation Center at W. L. Gore & Associates; Jay Eum, co-founder and managing director, TransLink Capital; Albert Kim, head of Ericsson Ventures; Pramila Mullan, senior principal, Accenture Ventures; Bonny Simi, president, JetBlue Technology Ventures; and Hash Pakbaz, senior director of emerging businesses and principal, Lam Research Capital at Lam Research. Students, faculty and alumni interested in competing should submit their materials to the competition website by 11:59 p.m. PST, on December 12, 2018. The 12 finalists will be announced in early January. The third annual UC Entrepreneur Pitch Competition is supported by ClearAccessIP, P&G Ventures and Lam Research. The “I am a UC Entrepreneur” campaign was first launched in 2016 to highlight the innovation and creativity of student, faculty and staff entrepreneurs. The 2017 competition focused on the work of those among UC’s 1.8 million alumni. This is the first year the annual competition will be open to all students, faculty, staff and alumni. For more information and to enter, visit the competition website. Learn more about the 2018 UC Entrepreneur Pitch Competition from Senior Vice President of the Office of Innovation & Entrepreneurship Christine Gulbranson and past participants. How do you grow an entrepreneur?